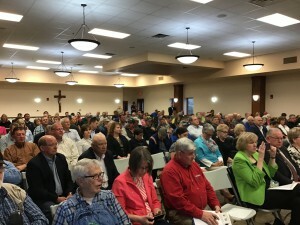 Hundreds packed a meeting hall in Glenwood, Iowa, Wednesday, April 17, for a U.S. Senate Committee Hearing on the U.S. Army Corps of Engineers’ management of the Missouri River flooding in March 2019. Senator Joni Ernst (R)-Iowa, chaired the hearing, and three other U.S. Senators, Kirsten Gillibrand, (D)-New York, Charles Grassley, (R)-Iowa and Jerry Moran (R)-Kansas, also questioned the Corps. The hearing started with two high-ranking Army Corps of Engineer officials who explained how the historic flooding occurred, whether it could have been prevented, why it keeps happening and how to prevent it from happening in the future. 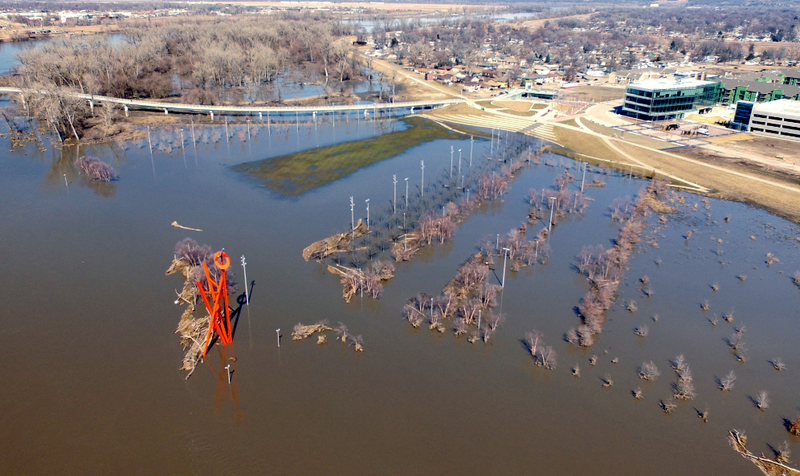 “Our Corps personnel have been working tirelessly to help reduce the effects of this flood and to provide assistance to states and local communities,” said John Remus, Chief of Missouri River Basin Water Management for the U.S. Army Corps of Engineers. 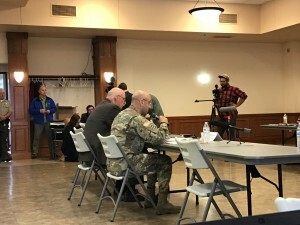 Major General Scott Spellmon, Deputy Commanding General for Civil and Emergency Operators for the U.S. Army Corps of Engineers, explained how the flooding unfolded. 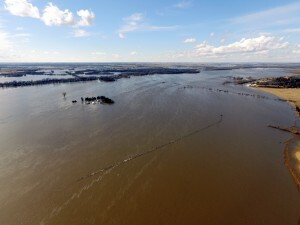 He said the Corps tried to manage the river flow, but once the bomb cyclone hit the region, it created record-setting inflows for many of the Missouri River’s tributaries, which overwhelmed the system and caused extensive levee damage just south of Omaha to Kansas City, Missouri. 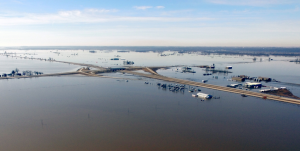 “At least 32 levee systems were overtopped or completely underwater and at last count, the Corps has discovered 114 breach sites. The Corps is currently working to close two breaches upstream of the City of Hamburg. 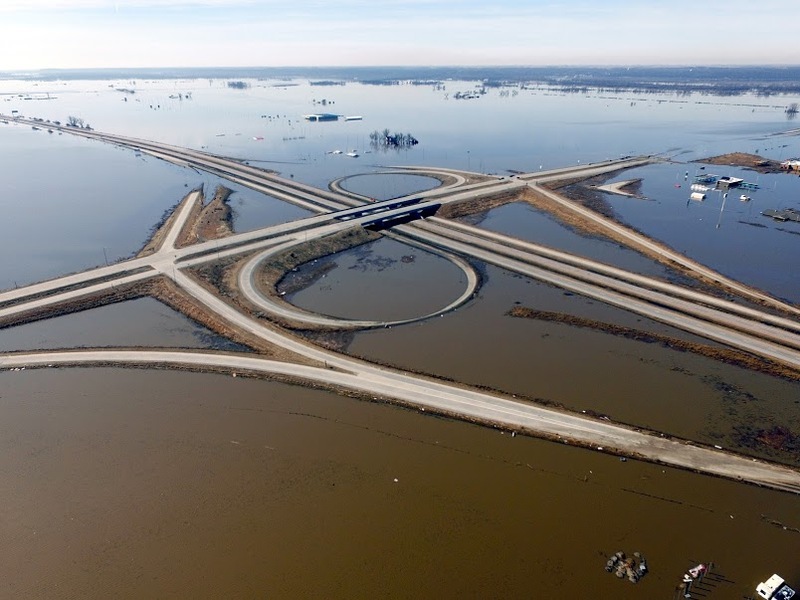 It will require nearly one million cubic yards of material to complete emergency initial closures. That’s the equivalent of 100,000 dump truck loads of material,” said Major General Spellmon. 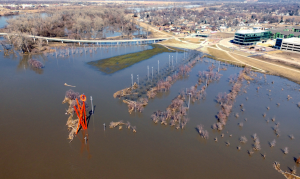 “The Corps is also providing emergency assistance to the community of Peru, Nebraska by constructing a berm around a sewage treatment facility in the floodplain. 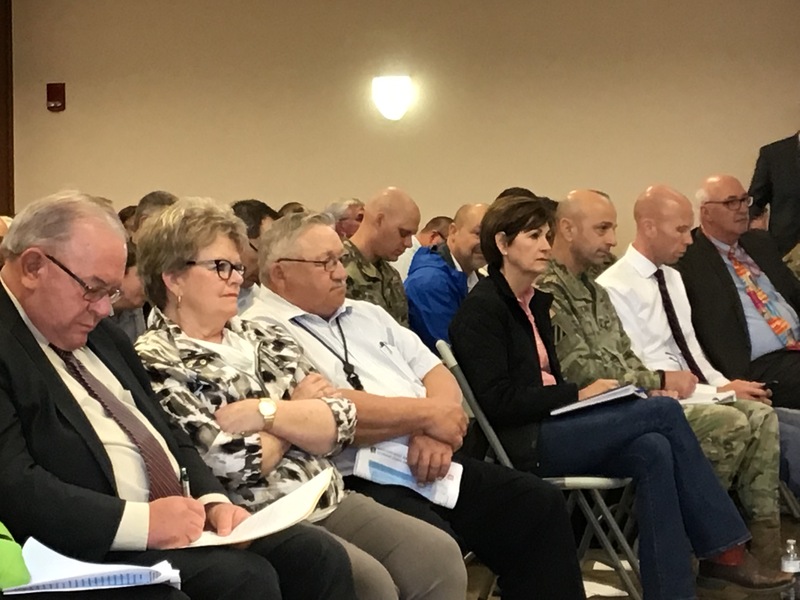 It’s also helping the communities of Pacific Junction and Glenwood, Iowa, by providing protection to a water treatment facility in the floodplain,” said Major General Spellmon. Senator Gillibrand, who is one of 18 of Democrats running for President in 2020, said she is heartbroken over the loss she has seen in the region. She talked about the devastating effect the flooding has had on family farms and the need to get rid of partisan politics. 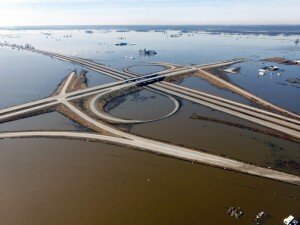 “This flooding shows the very real impact of climate change. 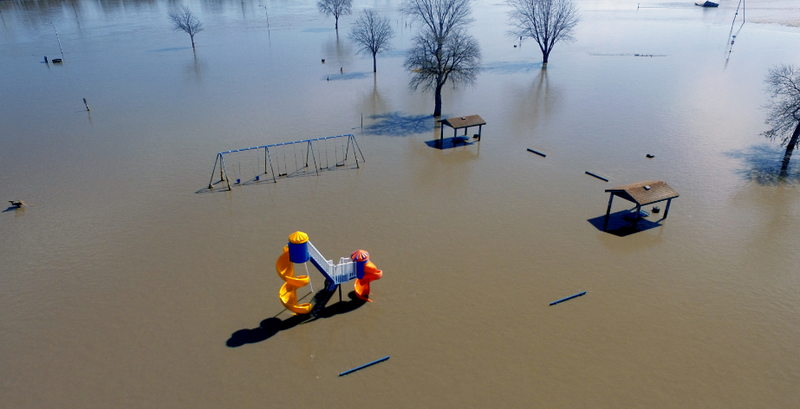 We are having 100-year floods, every five years. 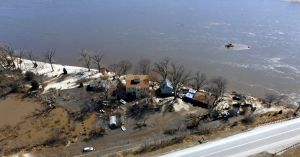 Floods like this one can and will happen again and the U.S. Army Corps of Engineers is too slow and too bureaucratic to respond properly to the crisis,” said Senator Gillibrand. 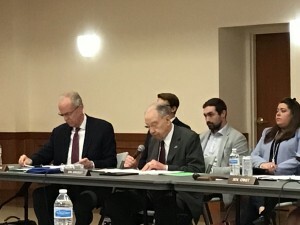 Senator Grassley disputed the Corps’ assertion and cited a lawsuit in which a judge found the environmental changes to the Missouri River to protect fish have made it more prone to flooding. 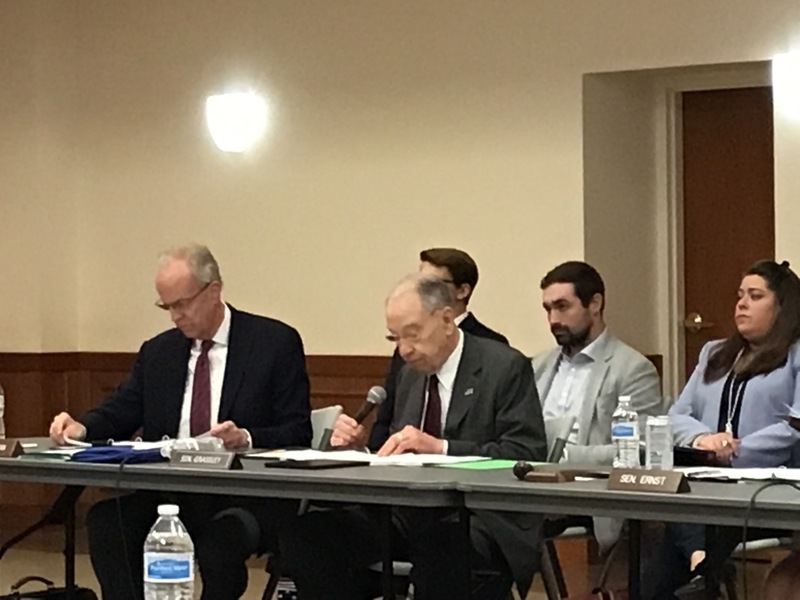 The Corps said it must comply with federal laws, and reminded Senator Grassley the lawsuit is not final and is just now entering the second phase. 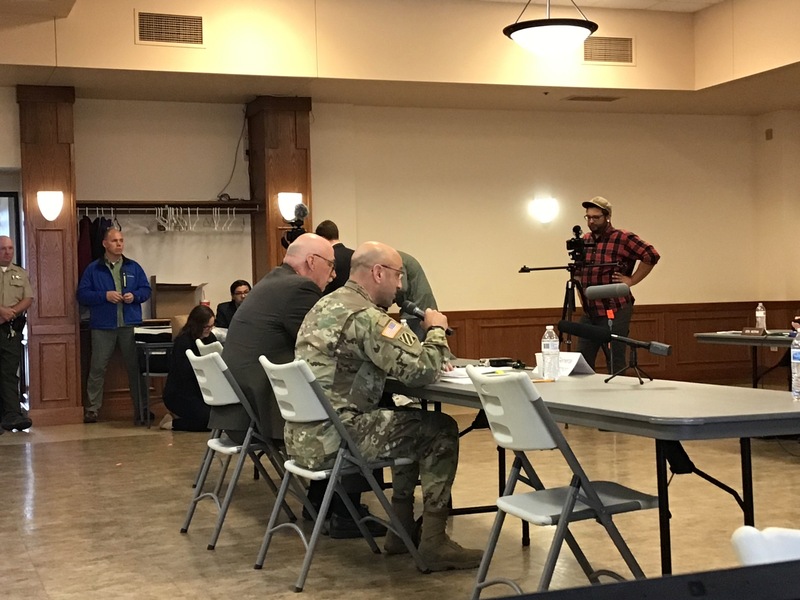 Major General Spellmon, also pointed out, the Corps has not received any instructions from the judge to change any of its policies. The senators also had questions about the Corps’ vision, ability to communicate during a crisis and its funding. 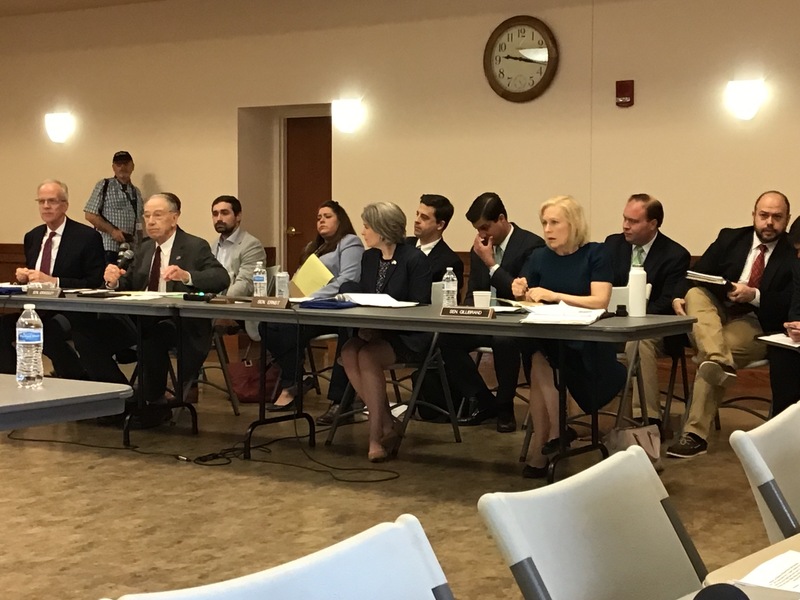 Senator Gillibrand asked why the Corps isn’t looking at redesigning dams in the region to meet this increased capacity. ”Why aren’t we being proactive? This is not new,” said Senator Gillibrand. 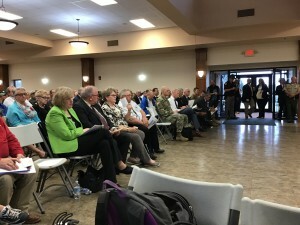 The Corps said redesigning a dam is a huge undertaking and cited the lack of funding. Something all the senators agreed is a huge problem. “The City of Hamburg, isn’t an isolated case, there are lots of Hamburgs. 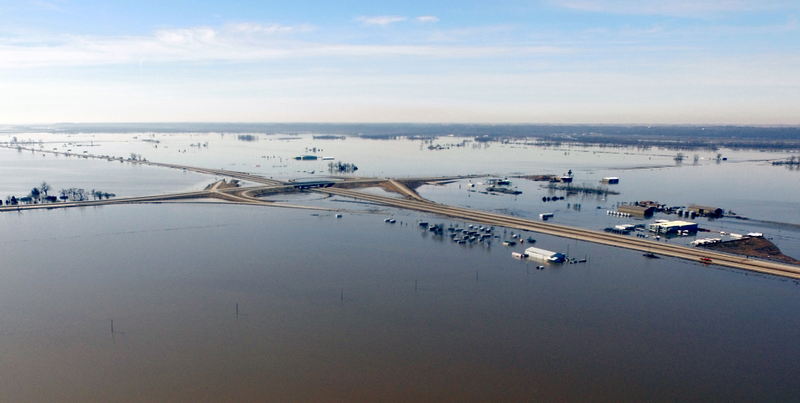 We are facing a $98 billion backlog in flood containment projects. We need to take this seriously and protect our communities,” said Senator Gillibrand. She also expressed frustration with the Office of Management and Budget and its cost to benefit ratio for ranking projects. “Land values are just worth more on the coasts, than here in the Midwest, so their projects get priority funding. Then we have crises like the one we see unfolding in the Midwest because there wasn’t money to rebuild the levee in Hamburg,” said Senator Gillibrand. Senator Ernst agreed and pointed out it took 10 years to get funding to build Cedar Rapids’ flood mitigation system, because it was all based on property values. Senator Ernst also criticized the Corps’ lack of communications during the flooding, “At the height of the flood we had private citizens taking drone video to monitor the levees. Why? Where was the Corps?” Major General, Scott Spellmon, admitted communication is a big problem and promised to do better in the future. The pain of the devastation is still evident for affected communities even weeks after the flooding. 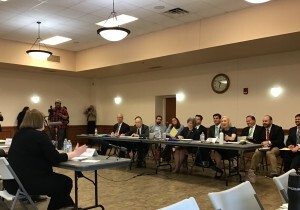 Cathy Crain, Mayor of Hamburg described to the senators what happened in her town on March 17, 2019. “Our fears were realized when over 11 feet of water captured our town. 169 of 560 homes, 88% of our businesses and two-thirds of our town were underwater,” said Crain, her voice nearly breaking at times during her testimony. “No restaurant, gas station, hair salon, barbershop, parts store, drug store, grain elevator, insurance office, bank, motel or farm implement dealership can open. There are no dry buildings for our businesses to move too,” said Mayor Crain. 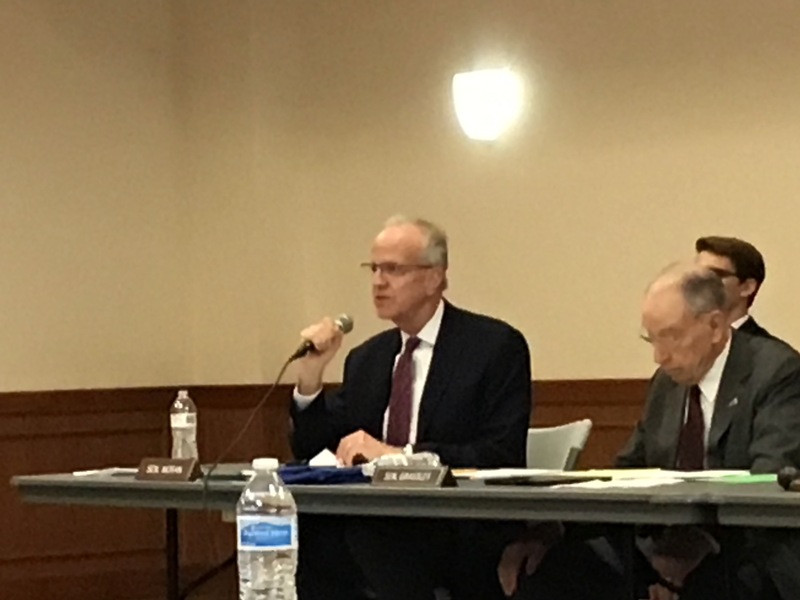 Kansas Senator, Jerry Moran, said the Corps needs to see the big picture when it comes to flood control. “This can’t be a piece-meal, isolated approach. The only way we’ll fix the problems we’ve heard about is if we make a long-term commitment to address the issue. 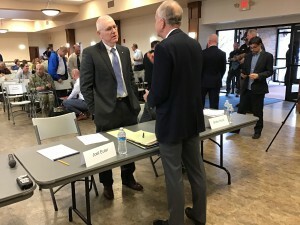 That’s going to take due diligence on all our parts,” said Senator Moran. 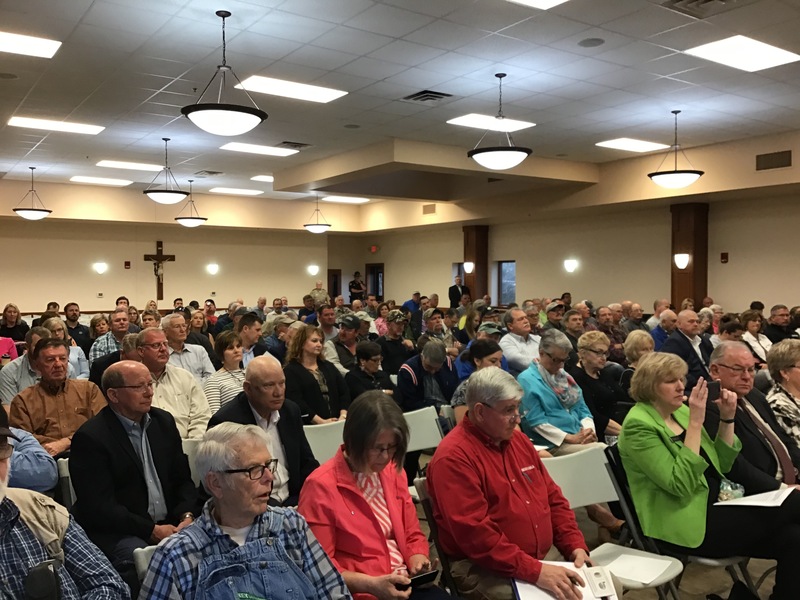 “When flood recovery is complete, we will have failed if every structure is the same as it was, and if the management of the river has not changed. To do the same thing and expect better results is the triumph of hope over experience. 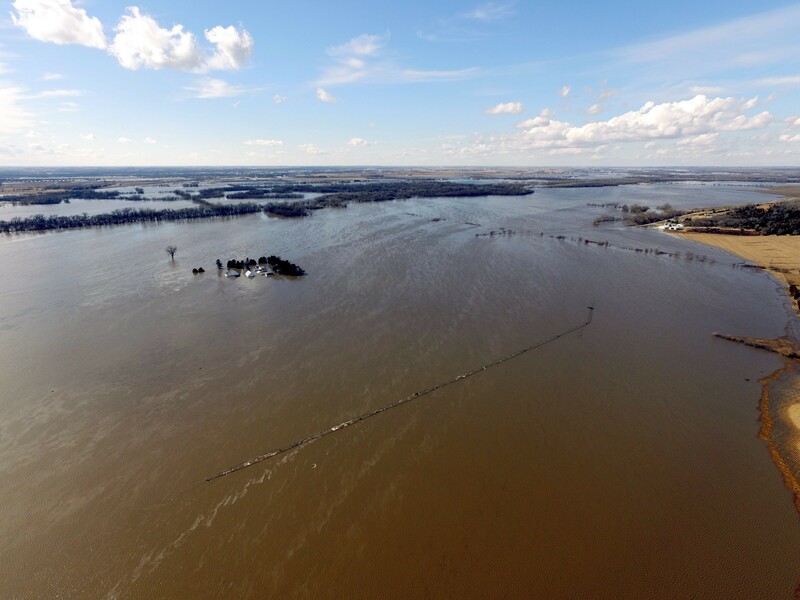 We simply cannot settle for the pre flood status quo,” said Blake Hurst, Missouri Farm Bureau President. Pothole Problems? Help is a just a click or phone call away!